For Mother’s Day, impress her with our Health-e-Recipe for Chickpea Crepes with Spinach, Mushroom and Pesto. These unusual treats use chickpea (garbanzo) flour, often found in the gluten-free section in your supermarket. Chickpeas are in the bean family and provide fiber, vitamins and minerals. Crepes are thin pancakes that are popular in France and Italy. It isn’t hard to get the knack of making them – it’s all in the wrist! Just rotate the pan as you pour the batter so it flows into a round shape that thinly coats your pan. Cook each crepe 1-2 minutes over medium heat until golden, then use a large spatula to gently loosen and then slide it onto a large plate. Re-oil pan and repeat the process for each crepe. 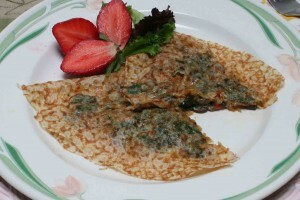 Adding spinach, mushrooms and red peppers bring each filled crepe’s cancer-fighting fiber content to 4 grams. These and all plant foods are loaded with different cancer-fighting compounds. Eating a variety gives you a combination of phytochemicals such as indoles, carotenoids, flavonoids and others that work together to reduce cancer risk. Find more excellent cancer-preventive recipes at the AICR Test Kitchen. Subscribe to our weekly Health-e-Recipes.